Good afternoon to you all. Time for another challenge at OSAAT. This time we would like to see your project showing appreciation. It doesn't have to be a card; we love seeing any type of project. 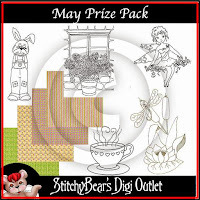 My image is Kyo from Stitchy Bear's Digital Stamp Outlet. The designer is Kaz Krafts and you can get it here. This includes a pre-coloured image as well as a line drawing. I actually made use of the pre-coloured image this time since it was the perfect match for the paper I had chosen. Cherry Blossom paper - Docrafts "Lucy Cromwell"
Because the image was pre-coloured this card came together so quickly and so easily. If only they were all like this! I hung the Dancing Lanterns with embroidery thread so they really do dance - well sway anyway! I computer-generated the sentiment and then cut the die cut in half so it resembled a fan. Some tiny pink gems finished it. The Auvergne and Provence dies are rapidly becoming my go - to favourite dies right now. The plain dies are a perfect backing for so many images. The prize you could win. Well that's all from me today. Hope you are all well. Gorgeous card, love the image and papers. Loved your last post too with the umbrella, gorgeous. Christine this is gorgeous. I love the background paper. Gorgeous card Christine, I love the image and wonderful detailing. Wonderful image, and beautiful paper. That fan is fantastic, and what a find, as it goes so well. Beautiful card, Christine. Love so many special elements...like the swaying lanterns and the wee fan! Lovely card, a very pretty image. 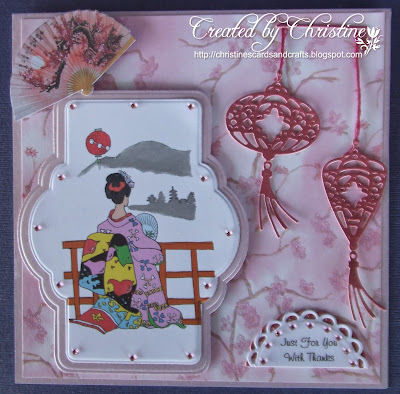 Love the oriental feel of this and the pretty papers. The dies do indeed complement your super design. This is so sweet. I love the oriental flair. A very pretty card! 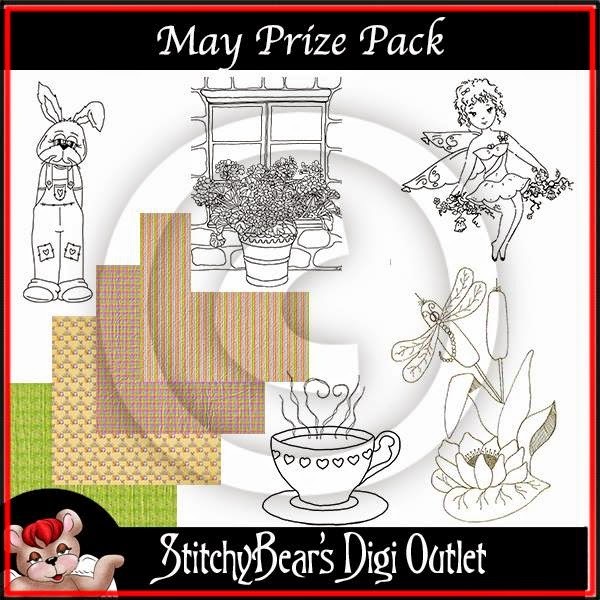 Thanks so much for participating in our THE STAMPING BOUTIQUE challenge!! Hope to see you again for our next challenge! !